What is FUE and how is it done? FUE (Follicular Unit Extraction) is the latest method of hair restoration in which hair roots are extracted or ‘harvested’ individually. 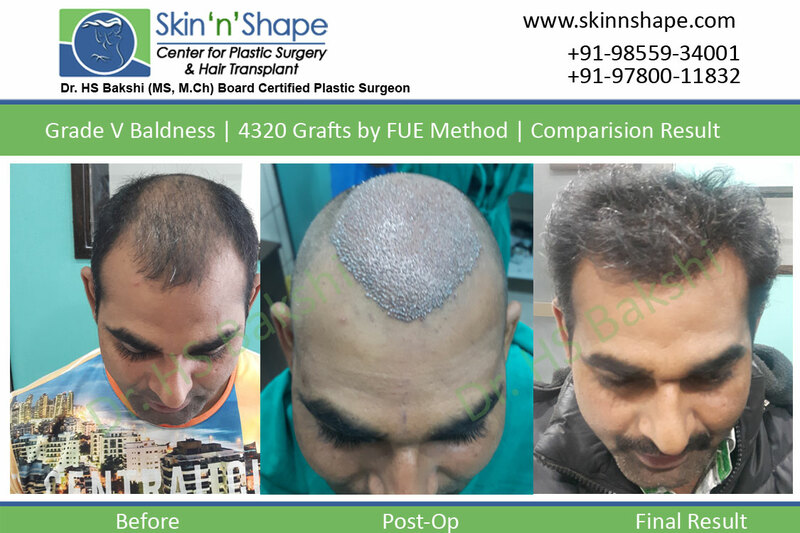 In FUE hair transplant technique, the method of extraction is different from FUT but the method of hair implantation is the same as that of FUT. 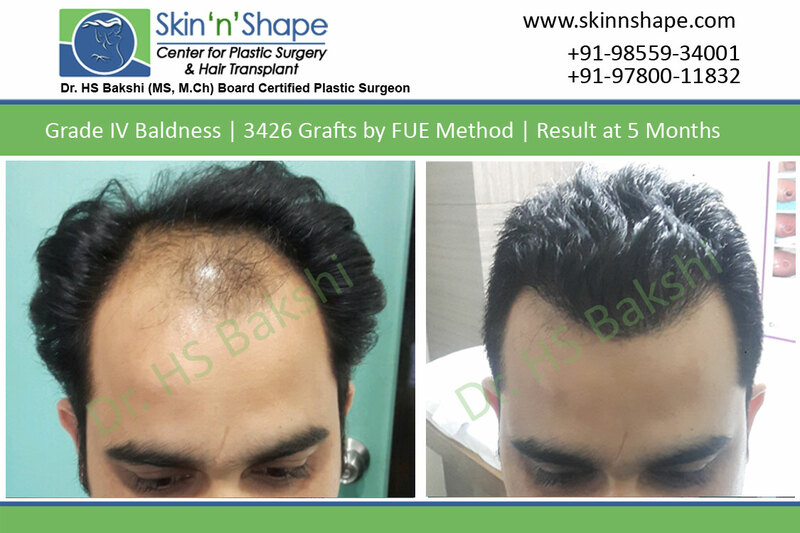 FUE is a ‘stitch less’ method of hair restoration in which hair follicles are extracted from the donor area under local anaesthesia with the help of special micro-punches. 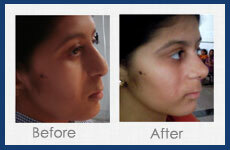 As the donor areas are very tiny, the donor area does not require placement of stitches as in FUT. 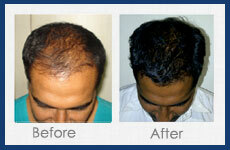 The entire donor area on the back of the head is trimmed to 1–2 mm length a day prior to surgery. The patient lies in the face-down position on the operating table. Local anaesthesia diluted with saline is given slowly over the entire donor area. In an FUE hair transplant procedure, a small punch (micro punch) of 0.8 or 1 mm size, mounted on a motor is used to make a small, circular incision in the skin around a follicular unit, separating it from the surrounding tissue. 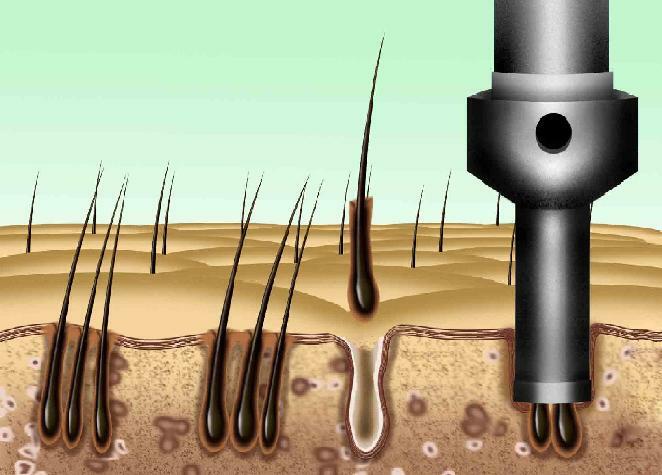 The hair unit is then extracted (pulled) directly from the scalp under 2.5 – 5× magnification, leaving a small open hole. This process is repeated until the Plastic surgeon has harvested enough follicular units for the planned hair restoration. This process can take 2-3 hours and, in large sessions, may be accomplished over two consecutive days. 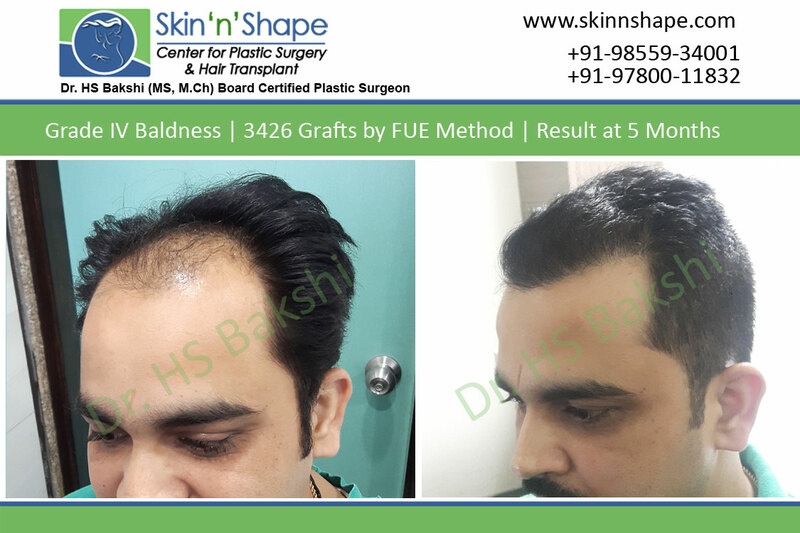 If you are looking for the best FUE hair transplant in Chandigarh, Panchkula, Bathinda, Ludhiana, Amritsar, Patiala, India, contact Dr. Harpreet S. Bakshi. 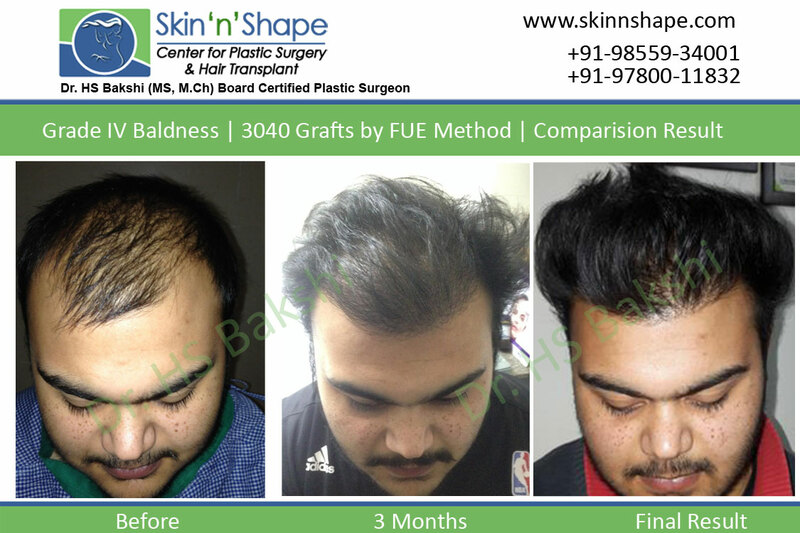 He uses the latest techniques for FUE hair transplant treatment to give his clients the best results. How is FUE different from Strip technique? The donor wounds, approximately 0.8 mm in size, completely heal over the course of next seven to ten days, leaving very tiny scars hidden in the hair in the back and sides of the scalp. This method of donor harvesting, removing follicular units one-by-one directly from the scalp, is what differentiates the FUE procedure from a traditional ‘Strip technique’ where the donor hair is removed from the scalp as one thin, long strip of skin bearing hair and then subsequently dissected into individual follicular units using a microscope. In FUE procedure, no cut is given to remove strip of skin as is done in the ‘strip’ surgery & the entire ‘stitch less’ procedure is done under local anesthesia. After the grafts are harvested, tiny “recipient sites” are made in the balding area of the scalp using a fine needlepoint instrument or slit blade. The follicular units are then placed into the recipient sites with the help of fine forceps where they will grow into healthy hair-producing follicles. 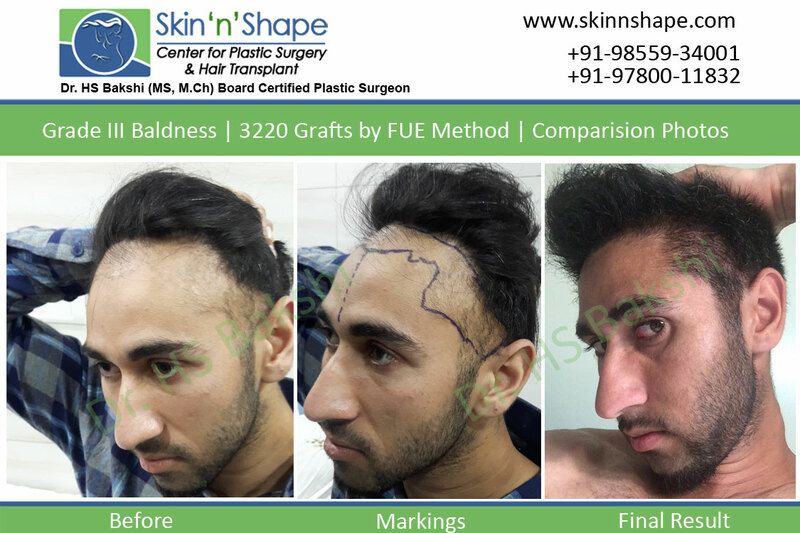 The creation of recipient sites and the placing of follicular unit grafts are essentially the same in both FUE and ‘Strip’ procedures. 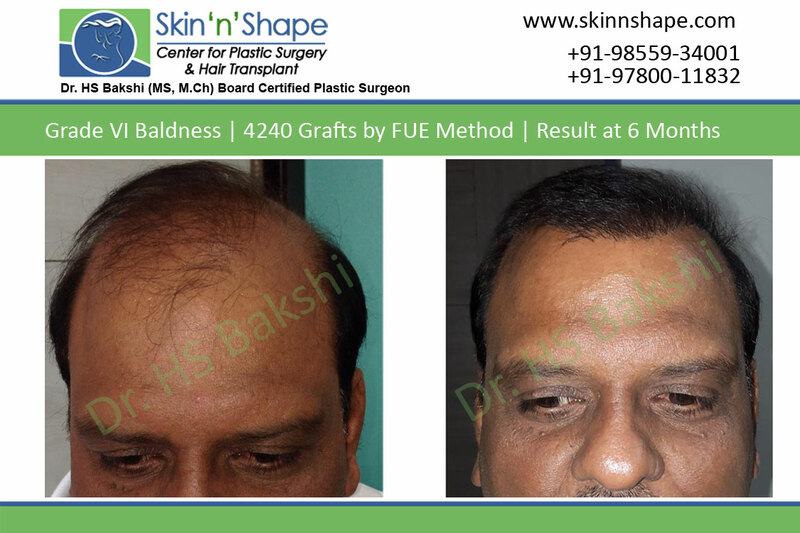 Who are the ideal candidates for due FUE hair transplant? 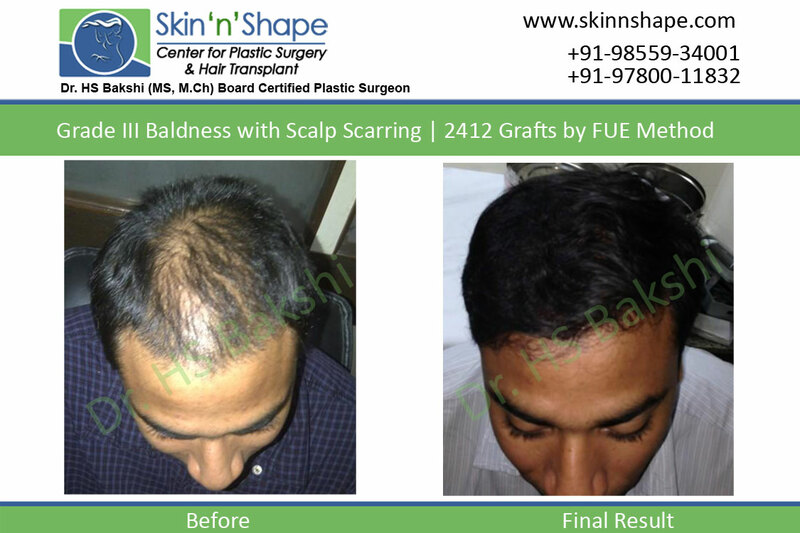 FUE is very useful in persons who keep small hair or shave their heads, as no scar line is visible after surgery. It is also ideal for persons who have tendency of hypertrophic or prominent scars because they will not have a long visible scar. 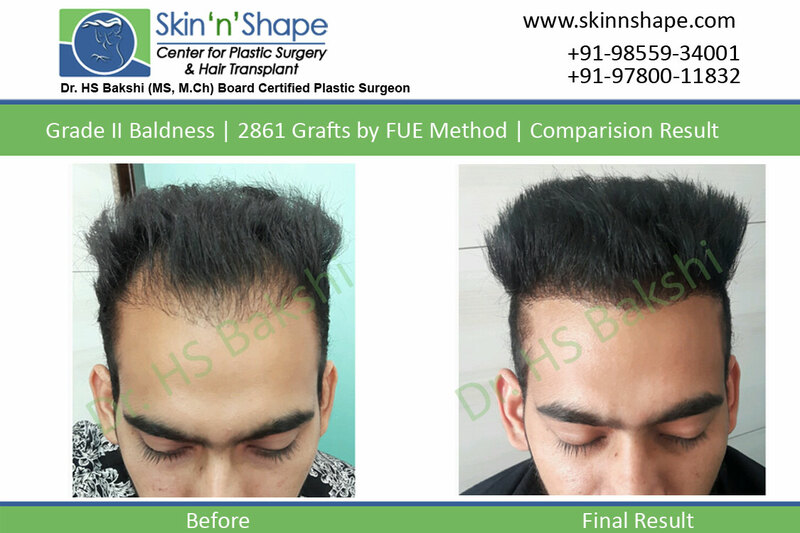 FUE is only method by which adequate cover can be given for Norwood Grade VI-VII as the hair can be extracted from the head as well as the body areas in multiple sittings. 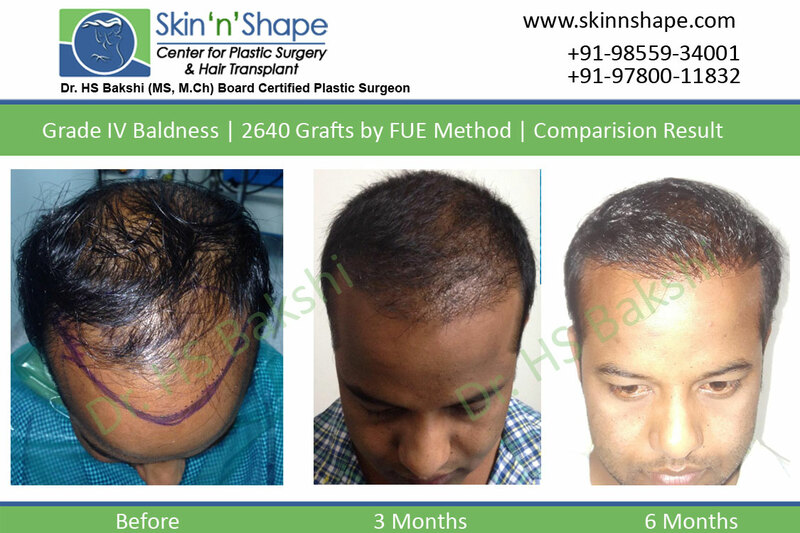 As compared with FUE, in the strip technique of hair transplantation, the number of hair is limited as only those hair grafts, which are removed in the strip, can be used for transplant. 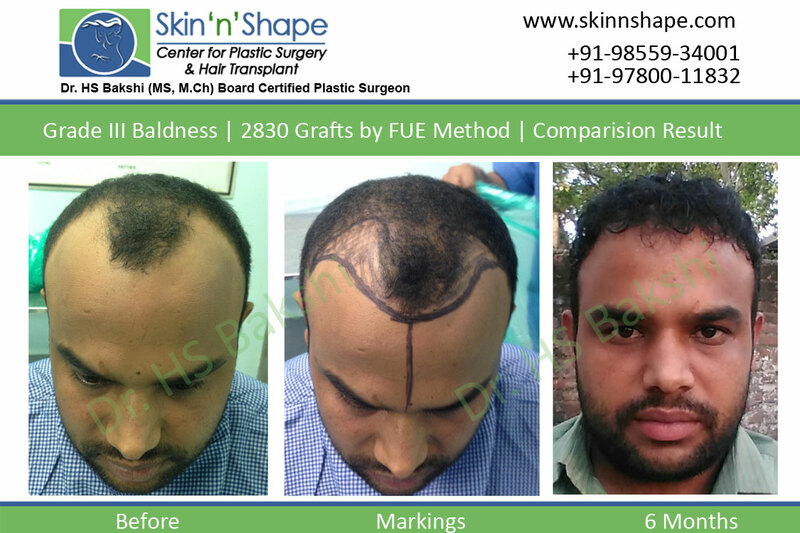 FUE is also the preferred technique for eyebrow or moustache transplant. It is also recommended for revision cases i.e. 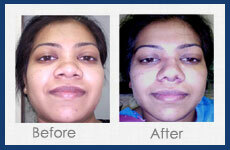 those who have already undergone surgery by strip method. 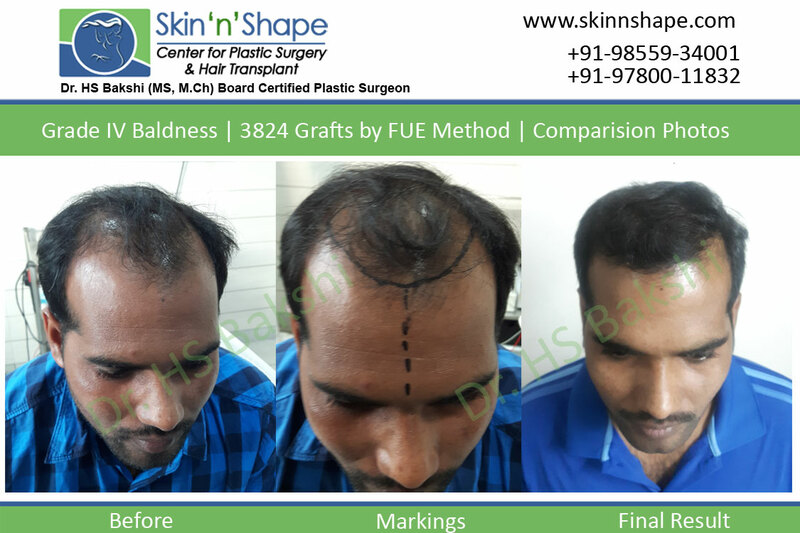 FUE method is also a method of choice in patients with inelastic skin in the back of head, as strip of skin cannot be removed in these patients. 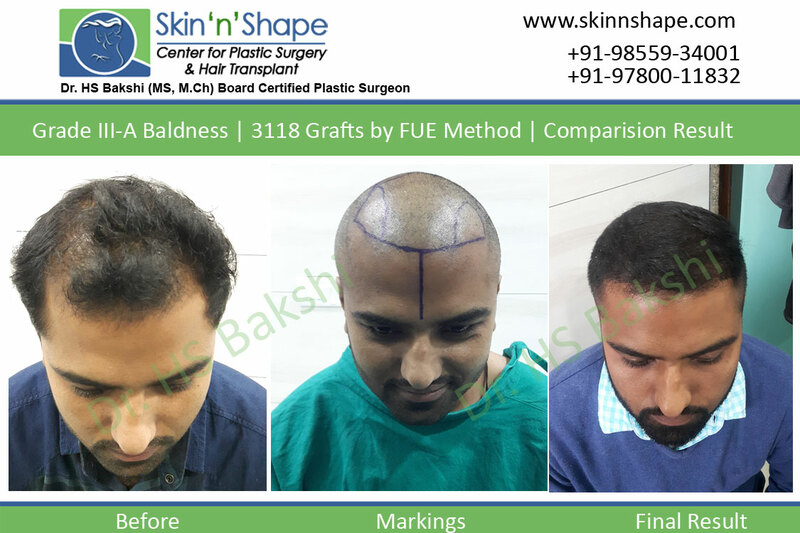 With FUE, multiple sittings can be used to give “add-on” hair to improve the density of hair. In athletes and persons involved in physical activity, who must resume full activity immediately after the procedure as healing is much quicker in FUE technique. In persons with an inordinate fear of pain or scars due to removal of skin and placement of stitches. 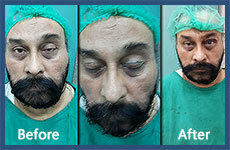 When body or beard is used as a donor area as FUE technique is the only technique useful in body hair transplantation. The earlier indication of limited areas of donor site with FUE technique has been overcome by Body Hair Transplant (BHT).